Gathering with family and friends for eight days of Hanukkah festivities is one of the most treasured elements of the Jewish religion. Full of tradition, games, and lots of good food, the Festival of Lights will be celebrated this year on December 2-10, 2018. 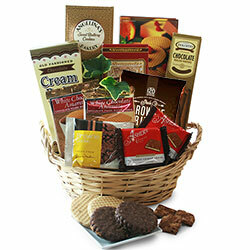 Send your well wishes to loved ones with our Hanukkah gift baskets. 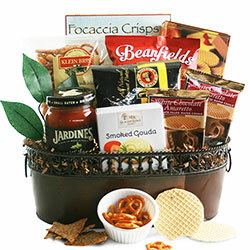 Full of gourmet kosher foods and treats, each basket has its own special collection of curated items. 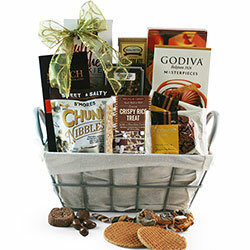 There are several to choose from, but if you don’t see the perfect basket in our pre-designed options, you can create custom Hanukkah gift baskets with our easy Design It Yourself system. 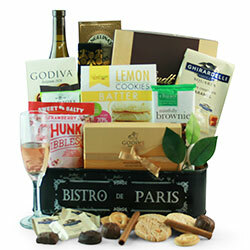 Every gift basket on our site can be gift wrapped for the holidays. 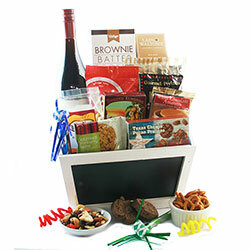 Simply indicate the Occasion on the Product page! 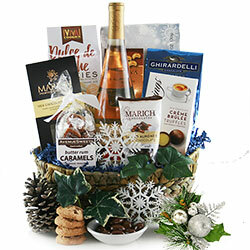 We know how important it is to send friends and family a thoughtful present for the Festival of Lights. 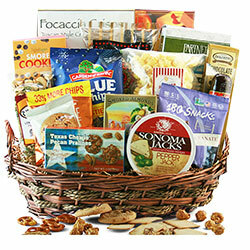 Our kosher gift baskets are specifically designed for Hanukkah and are full of surprises. 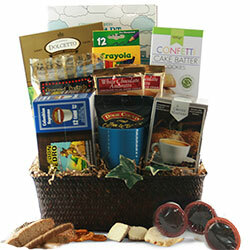 For example, the Happy Hanukkah Gift Basket includes a gourmet tea collection, as well as a variety of tasty food and snacks ranging from Tuscan-style crisps and aged cheese to seasoned pretzels and smoked almonds. 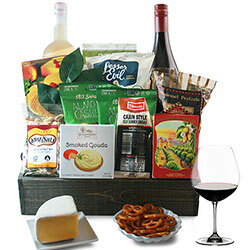 For a different flavor profile, check out the Hanukkah Time Hanukkah Basket. 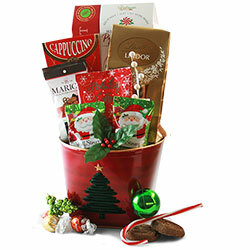 It includes a deliciously sweet, rich and creamy collection of Godiva, Ghirardelli and Lindt chocolates to name a few. 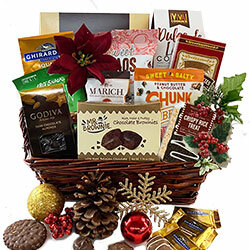 There are other Hanukkah gift baskets to browse through as well — as sure as the dreidel spins, you’ll find the perfect basket to send someone for the holidays. 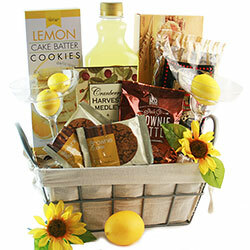 Great for hosts - Gift baskets are ideal Hanukkah gift ideas for anyone who will be hosting a celebration. 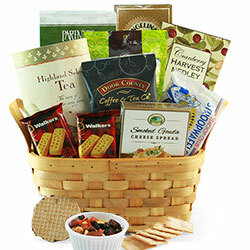 The products can be used to help feed the guests; no cooking needed! 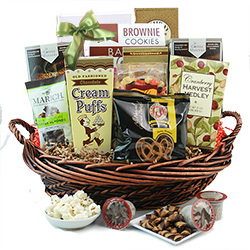 Family friendly - Because the gift basket contain a wide assortment of items, you’re sure to please the whole family’s tastes. 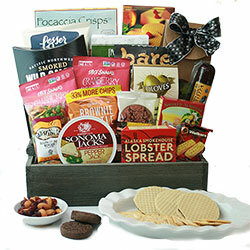 Unexpected - If you’re looking to mix it up from the Gelt (chocolate coins) you give out every year, a Hanukkah gift basket with it’s assembly of gourmet items is just the ticket. 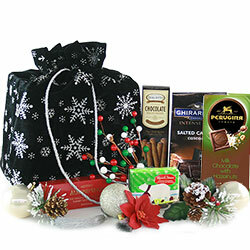 Hanukkah and Christmas fall near each other and some families celebrate both holidays. 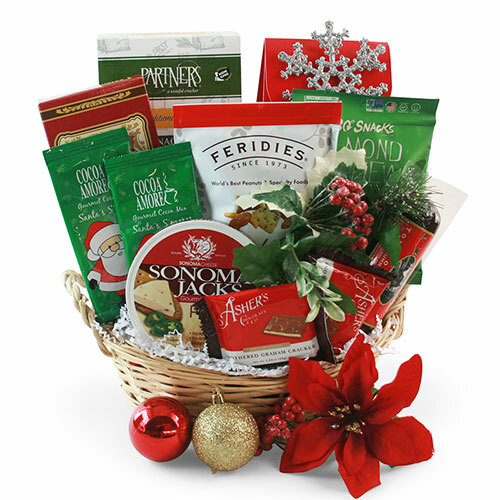 If you’re also looking to send a Christmas gift basket, we have holiday gift baskets for families too! 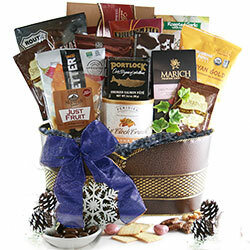 Whatever the season or reason, we have a entire selection of baskets that will bring good tidings to any recipient. 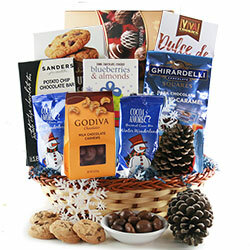 One of our most popular items is the Holiday Delight Gift Basket. 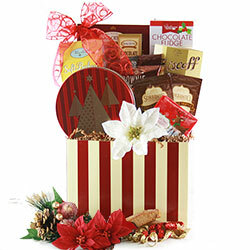 Cheerful and delectable, this collection of gourmet products includes mouthwatering cookies, decadent chocolates and your choice of wine — guaranteed to bring a glow to the cheeks of your gift recipient. 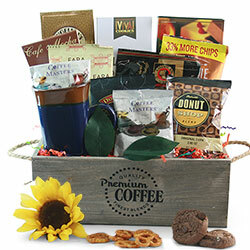 The Christmas Coffee Classic Gift Basket is another fan favorite with its wide assortment of caffeinated beverages. 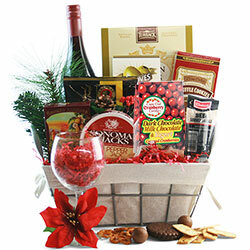 The basket comes with Coffee Masters Christmas Cookie Coffee, Wolfgang Puck Coffee, cappuccino drink mix, and a host of flavorful snacks to complement these brews.